But what does this mean for millennials in the federal workforce? Indeed, what do millennials really want from federal service? These are important questions. Government agencies need to know how to recruit and retain the best talent as they build the next generation of leaders, and understanding this cohort’s wants and needs is essential to doing both. A Federal News Radio survey – ‘The Millennial Perspective in Federal Government’ – of more than 900 current and former federal employees, managers, and members of Young Government Leaders revealed many millennials in government indicating that their agencies didn’t understand what makes them “tick”. 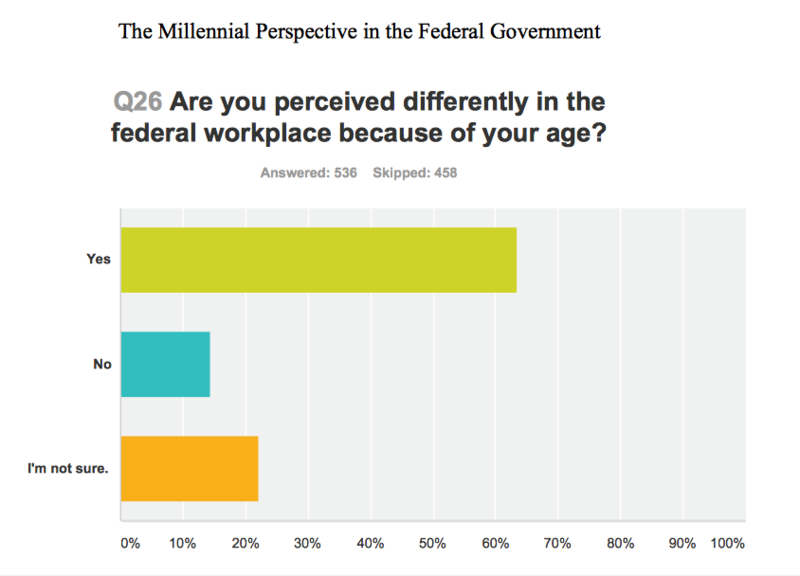 In fact, 63% of the millennial federal employees interviewed for the survey felt that they were perceived or treated differently because of their age – perceptions that many felt had a negative impact on their experiences in the federal workforce. Despite such discrepancies, the majority (61%) of millennial federal employees do indeed have a passion for public service and would prefer to stay in government for the long-term – provided that they have opportunities to develop their skills, careers and benefits. However, notwithstanding this promising millennial commitment to the sector, many complain that their agencies cannot understand how to engage them professionally, and, frustrated by the status quo, 39% say they anticipated leaving government within one-to-three years. As much of the federal workforce ages towards retirement, talent management initiatives to engage and thereby retain the next generation of government employees becomes increasingly critical. A 2015 report from Cornerstone OnDemand in association with WBR Digital – ‘Building a Culture of Excellence and Engagement’ – found that 78% of federal agency human capital executives felt that their talent management programs fell short of where they needed to be. 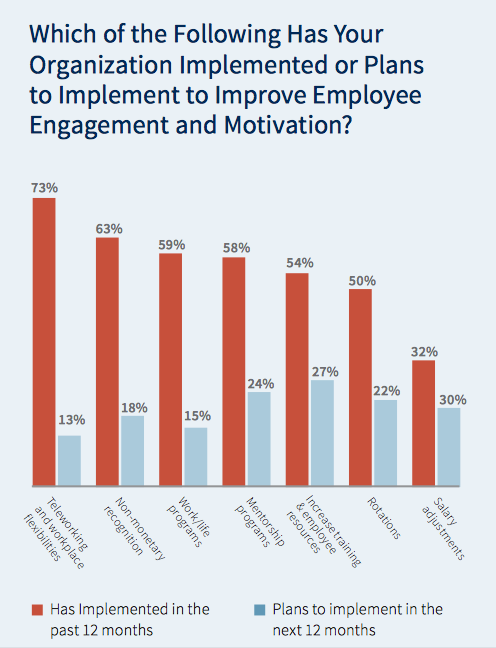 Two years later, the ‘HCMG 2017 Benchmark Study’, again from Cornerstone and WBR, finds that only 37% of government employers describe their employee engagement initiatives as “successful” or “very successful”. Another 37% said the same of job satisfaction, 27% of talent development, and 17% of succession planning. In order to compete with the private sector for the strongest candidates, government HR professionals need to find ways to establish an agency culture that attracts, nurtures, engages, and retains young employees. It means connecting with social and mobile millennials through the technologies and the channels that they are already using, and ensuring that there is effective leadership and communication in place to garner and act upon employee feedback. 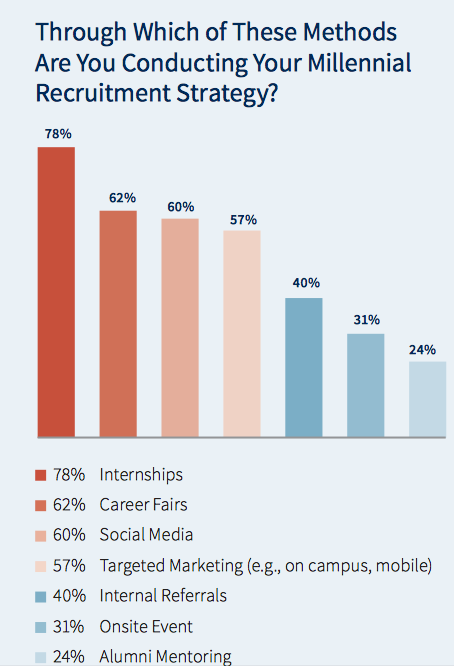 The ‘Building a Culture of Excellence and Engagement’ report revealed 78% of survey respondents relying on internships to recruit young employees. However, agencies have the opportunity to reach even more millennials via the popular social media channels that these people already frequent. Developing targeted messaging and outreach strategies on social media can be a strong tactic for spreading the word about available opportunities to a wider audience, increasing the number of hires, and engaging millennials within the digital environments they are already familiar with. Jennifer McDowell, CIO Realignment Project Manager at the US Forest Service, explains how she successfully used social media recruiting while working for the Department of Defense. "We worked to try to incorporate social media and YouTube recruitment videos into hiring aerospace engineers. For really illustrating different types of opportunities, social media geared toward sharing and recruiting proved to be successful." Resources to invest in talent management are often low. However, many government agencies are developing cultures of recognition in order to keep improving engagement levels. These include non-monetary strategies, such as employee awards, written and verbal appreciation, and celebrations of accomplishments or special dates like work anniversaries and birthdays. These are small gestures, but are designed to show appreciation, with 63% of agencies already employing such techniques. In order for any meaningful and sustainable cultural changes to occur – such as those that might prevent millennials from feeling like they are being treated differently because of their age – management needs to communicate with and listen to employees. 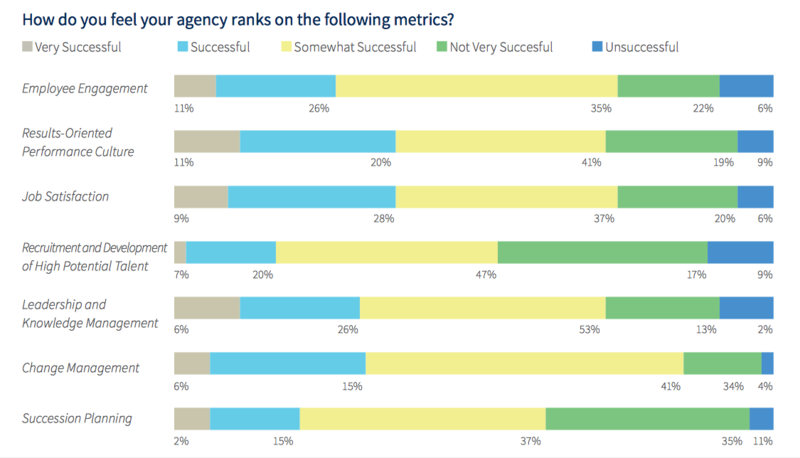 The ‘HCMG 2017 Benchmark Study’ reveals that only 25% of agencies rank their continuous feedback processes as being “successful” or “very successful” – though 40% said that they are currently investing in projects for improvement in this area. Developing a firm foundation for the future of government means listening to feedback and bridging the gap between employees’ needs and concerns and current leadership. By creating opportunities for dialogue, young talent will be encouraged and empowered to speak up and participate, and a confident generation of future leaders can be nurtured. What keeps millennials engaged may differ from the motivations that drive an older generation of federal employees. Understanding these motivations is key. It’s not always monetary rewards that the next generation of government talent is after. Teleworking opportunities and workplace flexibility are proving to be key drivers for engagement, as are work/life programs, and various non-monetary appreciation and rewards schemes. Ultimately, however, it comes down to the communication pathways that are enabled that will help leaders ascertain exactly what it is that makes the next generation of government talent “tick”. When these are opened up and new perspectives from a younger workforce welcomed, a more engaged and enthused generation of future leaders can be built. The last word goes to John Palguta, Vice President of the Partnership for Public Service. Employee engagement is set to be a hot topic at this year’s HCMG 2017, taking place in Westin Crystal City, Arlington, VA, this December.